Today was newlywed Scotts buddy fishing trip for Stripers on the Lake. He got married last week to the most beautiful woman on the lake, Sara. I had caught bait early this morning and picked the guys up at 6am on their docks. They have been partying all week and some of them had not even gone to bed for the night. That did not stop them from bringing a cooler of beer on board nor did it dampen their spirits for wanting to catch some Stripers. 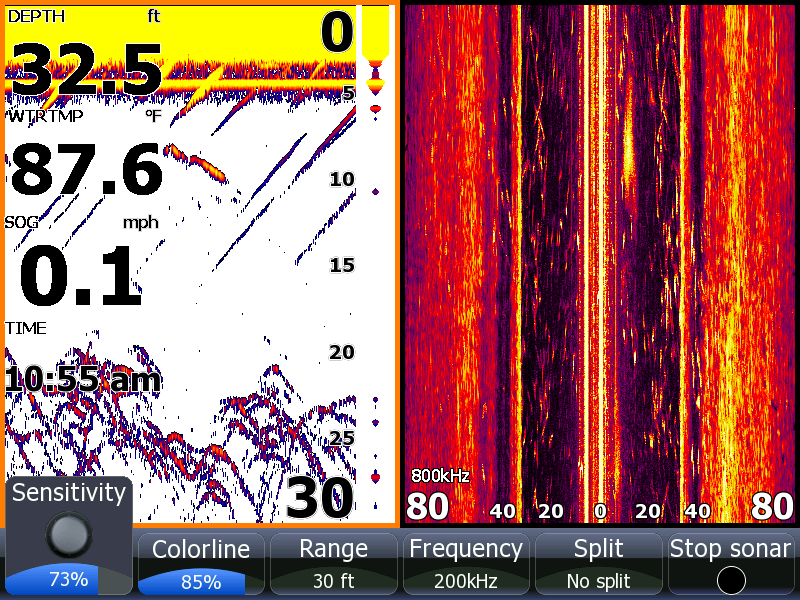 I had a plan to do something different so I drove to where I wanted to set up a spread of boards and before I could get my trolling motor down I glanced at my Lowrance and saw a major school of fish right up on the bank. I had not even had time to explain how to put baits out or anything so I scrambled trying to get as many baits in the water as quickly as I could. Before I knew it fish started breaking all around me so I struggled to get my topwater baits untangled so we could catch some on top. I asked if anyone knew how to cast and got no reply so I fired the bait out to the Stripers, twitched it twice and it got clobbered. I handed it off to Scotty and picked up another topwater with intentions of throwing it into the action but downlines started to hook up. If this sounds like action this was just the beginning, this went on from daylight to 8 o'clock when we ran out of bait. I went and caught more bait but the feed was essentially over, we fished a couple more hours and took about 6 or 8 more hits. Poor Nik, every time he would grab a rod with a fish on it he would loose the fish. Every time he would loose a fish the guys were a little bit more high and they would harass him more and more. Nik was cussing in English most of the time but toward the end he was saying some words in Greek that I could not understand but knew the meanings to. Once when he was trying to get a fish in Scotty attempted to stuff a 8 inch Gizzard down Niks pants. I think that brought Nik some good luck, he finally reeled in a nice Striper to end the morning of fishing and fun. This morning was a special morning, some of Scotts friends had never fished before plus this was a morning when they could get away from the girls and let it all hang out. Everyone was in great spirits and had a great time. Best wishes to Scott and Sara, may they be as lucky in love as their parents are. Earl married off his daughter this weekend and needed a short break before spending the week doing "Buddymooning" events dreamed up by the married couple. Dave and I caught bait and picked Earl and Christian up at 6 at Earls dock. I told them it would only be an early morning bite so we had our baits in the water at first light and it didn't take long for Earl to hook up with a nice Striper. Before he could get his in the boat 2 other rods bent over and everyone joined in the chaos. We boated all the fish, rebaited and continued to catch fish till an Osprey decided to eat one of my baits so we had to reel it in and release it unharmed. We caught a couple more fish within a few minutes but a fisherman in a pontoon boat decided he wanted to spook our school of Stripers and try to run over my planner boards. Well that was the end of catching fish there. We fished for a couple more hours only to catch a couple more fish. Earl is having a big cookout for the newlywed celebration on Saturday and needed some Stripers to go along with the ones they catch on Thursday when I take out Scotts buddys fishing. Cloudy and Warm, Water Temperature 85* and clear. I picked Jim and Lela up at 5:30 at High point and took off to catch bait. Lela got up very early this morning so she decided to take a nap while we caught bait. I had a tank full of bait by 6:15 then made a short run to where I wanted to fish. 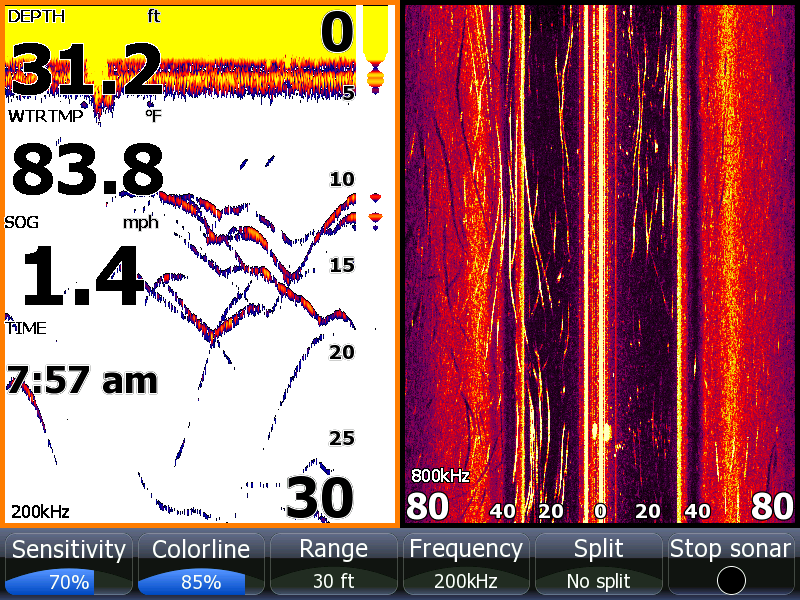 I set out planner boards and downlines so I could determine where the fish were and it did not take long to find out. Once I got a board within 10 feet of the bank it got clobbered. It was only 6:30 and the fish were still right up on the banks. As Jim reeled the first Striper in I moved the boat closer to the bank to put the next board in the zone and it hooked up before we even landed the first fish. Jim hollered to Lela to wake up and grab yet another rod that was bent over. We boated these 3 Stripers and had to regroup rebaiting our rods. I also turned the boat around so I could put the other 5 boards up on the bank where we just caught our fish. It only took about 10 minutes to get back on the bank but this time our outer boards started hooking up. The fish had already pulled off the banks and moved to deeper water. That was fine with me, I had all my downlines ready so I turned again and headed to where I thought the fish would be heading. 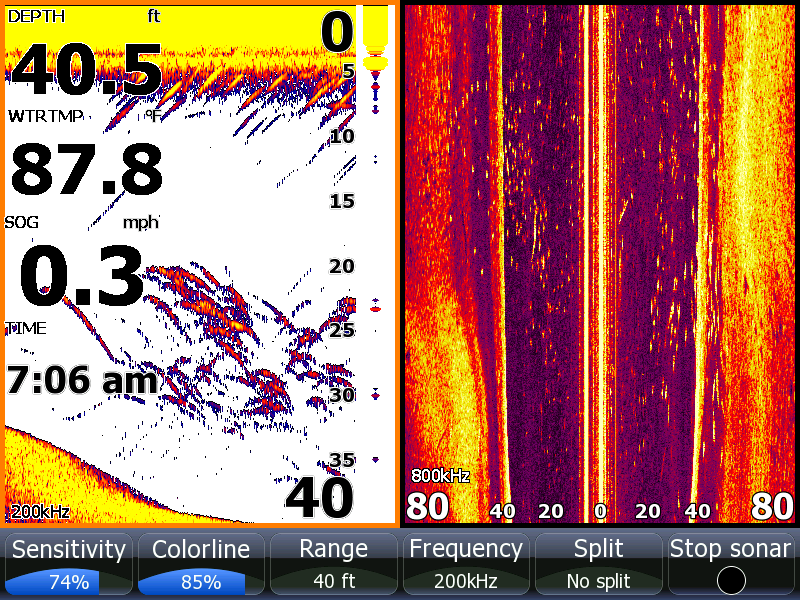 I had only gotten out a couple of downlines when both rods buried into the water. 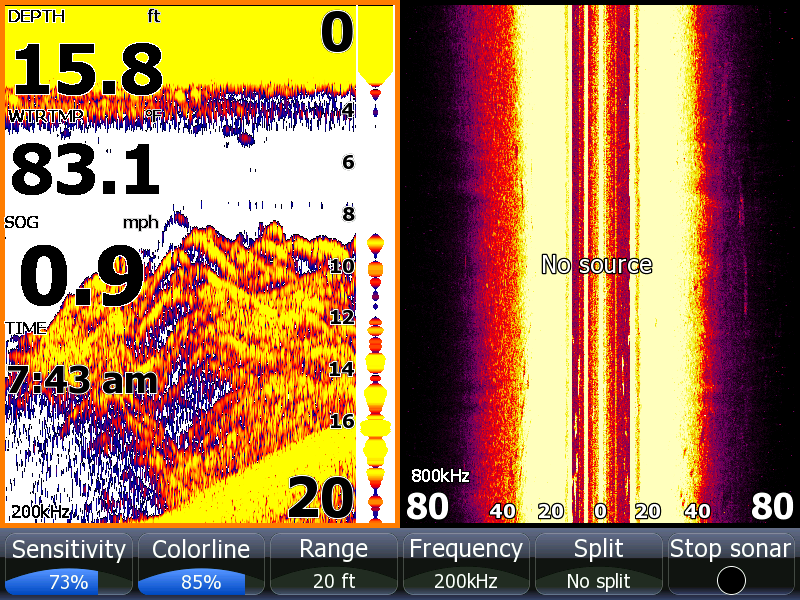 The picture of my Lowrance was taken as Jim was reeling in a downline. Before I could get more downlines out our boards started hooking up. Lela had laid back down and was sound asleep. We had rods bent all around the boat and Jim nor myself could wake her up. We did our best to get the fish in the boat but we could not handle the action. We lost the school while we were trying to get the boat straight and by the time we rebaited a boat drove by and spooked the school. We worked the area for a couple more hours only to catch 1 more fish. As usual for this time of year it is an early bite and the schools won't tolerate boats running over top of them. 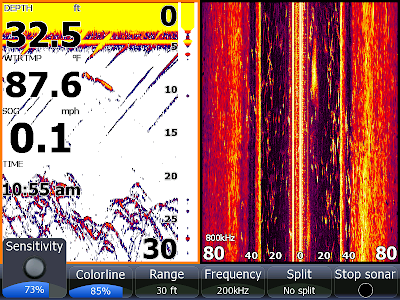 As you can see on my Lowrance the school of Stripers were literally stacked on this ledge coming out of 37 feet of water up on to a 15 foot flat. Cloudy and Cool, Water Temperature 84* and Clear. I took off last week to spend my grandsons last week of summer vacation with him so I wanted to get back on the water to locate some Stripers for my clients this week. I decided to try something completely different. 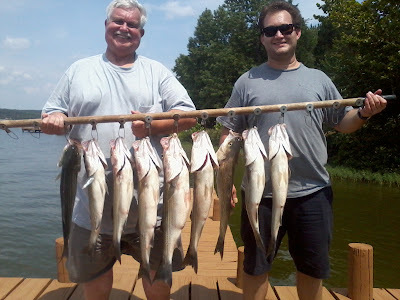 This morning I caught Gizzards instead of Herring and pulled boards away from all boat traffic. The move paid off, I took 14 hits the first hour of the morning before the resident idiot of the lake found me, nearly running over my boards then circling in front of me for about 15 minutes until he completely had the lake in a froth. I reeled all my baits in and caught some more bait. This time I went where no troller or spooner could mess me up. 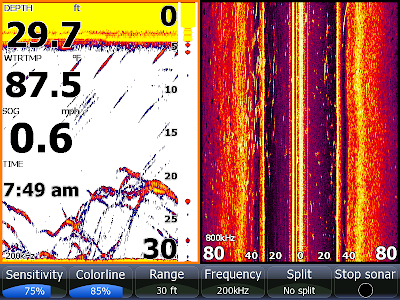 I put out a spread of boards and downlines and it didn't take long before I was hooked up with rods on both sides of the boat. I had four fish on at once and luckily boated all four fish but two of the lines got tangled. I did not have time to untangle them, I simply cut them off because my other rods were hooked up as well. I boated 14 Stripers in a time frame of about 15 minutes and tried to release them all unharmed. Of the 14 four of the fish were labored after being in the water for a minute so I retrieve the four that are in the picture and kept them for dinner and to give to a friend. The rest swam away immediately and are ready to be caught again. 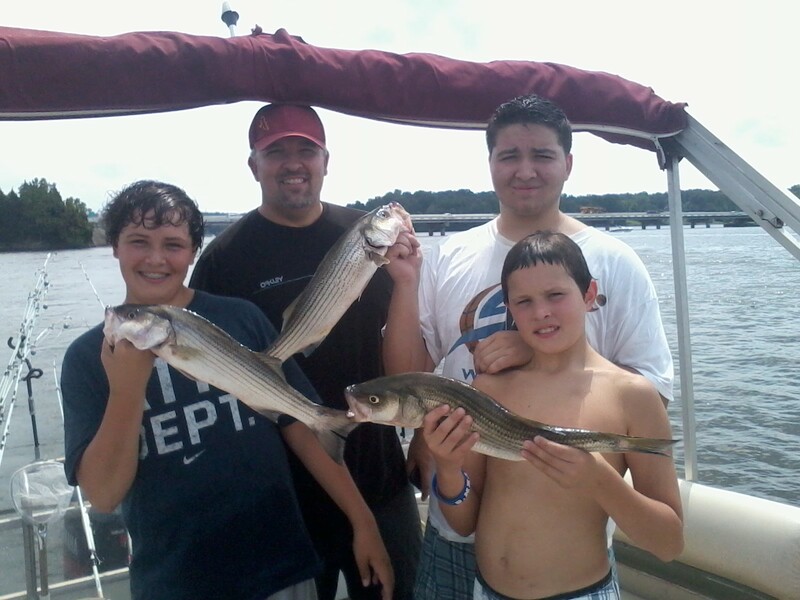 Guide Tony took James and his sons out this morning fishing for Stripers but as usual it was only a morning bite. Things got a little boring later in the day so Dad started a dare with Jackson that if he ate a Herring he would give him a hundred dollars and Tony said he would contribute $20 more. Jackson tried but could not do it. Then Tony tried but failed also. Dad had to show everyone how it was done and here is the video of what happened. Cloudy, Rain and Warm, Water temperature 88* and clear. This morning was a light show with lightning in the sky while I was catching bait. After putting 160 baits in the tank I picked the crew up at their dock and went looking for Stripers. We set up near some fish but they did not seem to be schooled very well, probably due to the weather. After a few minuted I decided to look for something else and it didn't take long to locate some feeding fish. We worked them for about 30 minutes, lost the school then relocated it and caught more. After using up all our baits I went and caught 200 more and went fishing again.We did not run into many schools today, only 4 or 5. We caught plenty of fish today and kept enough to eat tonight before packing up and heading back to Pennsylvania and New York. 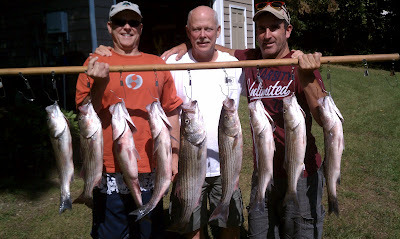 Guide Tony took Ken and Ryan out this morning for a day of fishing for Stripers on Lake Anna. Looks like a couple of happy anglers. 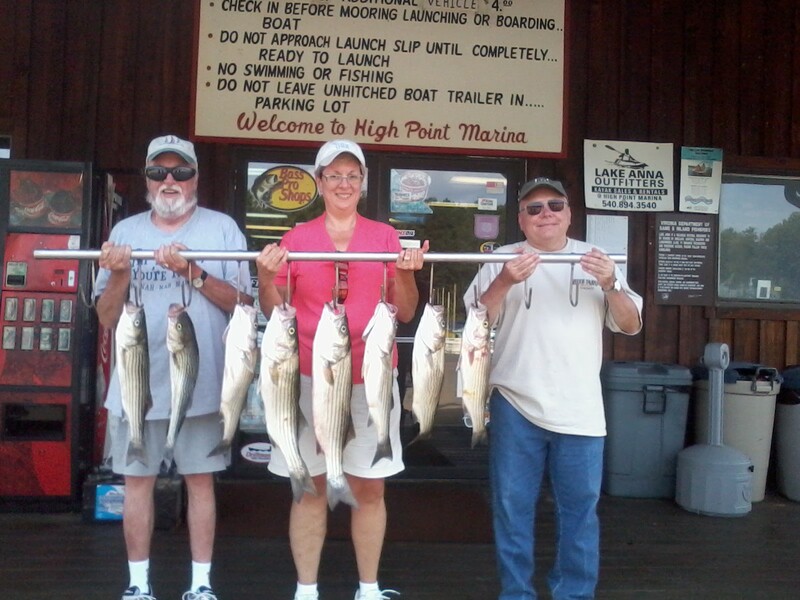 Guide Tony took these guys and gals out today and had some fun catching Stripers and Catfish. Today they caught about 40 fish today despite the thunderstorms. Another great day of fishing on Lake Anna. Tony has been spanking the fish lately. Cloudy and Warm, Water Temperature 88* and clear. Tom was interested in learning a little more about what I do so I met them at the marina at 4am, caught bait and went out to locate schools. I found a school at 6:15 and showed them how to determine if the fish were catchable and what direction they were traveling. Once they understood that I got out in front of the school, set out our baits and watched the rods bend over. It was quite interesting for awhile, they were busy reeling in fish as I was baiting empty hooks, netting the fish and at the same time teaching them how to use the side scan to keep on the school. 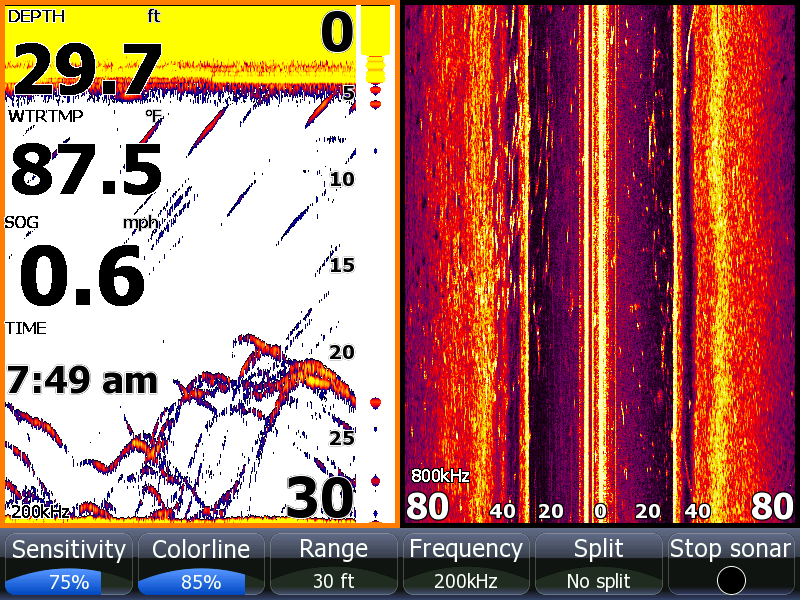 I popped this picture of my Lowrance at the tail end of the school prior to moving again to get back into them. We followed the school for about an hour, then the buzzards found us and unfortunately motored through the schools spooking the fish and ruining it for everyone. It didn't matter to us this morning, we caught the stringer before 7am and were releasing fish. It would have been nice if these boaters would keep their distance so Tony and his group of clients could have caught their limits. A storm blew in and we got off the water around 8 and called it a day. Guide Tony took the girls out this morning for a half day charter and we worked school after school catching fish this morning. Guide Tony took his crew out this afternoon for a fun day of fishing, This was Tony's second Charter for the day. Cloudy and Warm, Water Temperature 89* and Clear. Caught bait as early as usual then picked my clients up at 5:30 at High Point. After showing everyone how to deploy the baits I searched for schools of Stripers. I located some over 30 foot flats so we set up downlines at 22 feet deep and started catching Stripers. I called Tony[Guide] on the radio and told him to come on over and join in the fun. He was a little late arriving, after about 15 minutes the action was over. This particular school had broken up so we trolled around the pods of Stripers catching fish out of each pod. We would locate a school of Stripers, put herring in their faces and catch some Stripers, get inundated with other fisherman, leave that area, locate and set up on other schools just to get run over by inconsiderate fisherman. Tony and I would work the schools till the fish would spook. With 2 guides working schools of Stripers other anglers can't help but run over us and spook the schools. If only they knew their motors were not only spooking the fish but breaking up the schools! We finally got wise and left the area completely, located yet another school and worked it till Ann called the ball and said they had enough for one day. 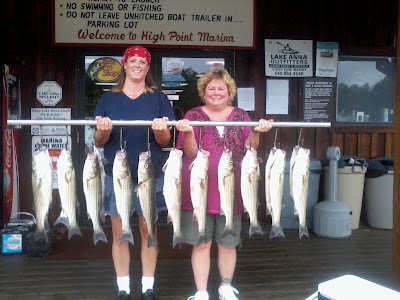 We caught about 25 Stripers this morning plus some catfish. I picked up my crew at 5:30 this morning after catching bait. The weatherman called for thunderstorms all day but we never got a drop. We looked for some schools but mostly all we could see were small pods of fish. 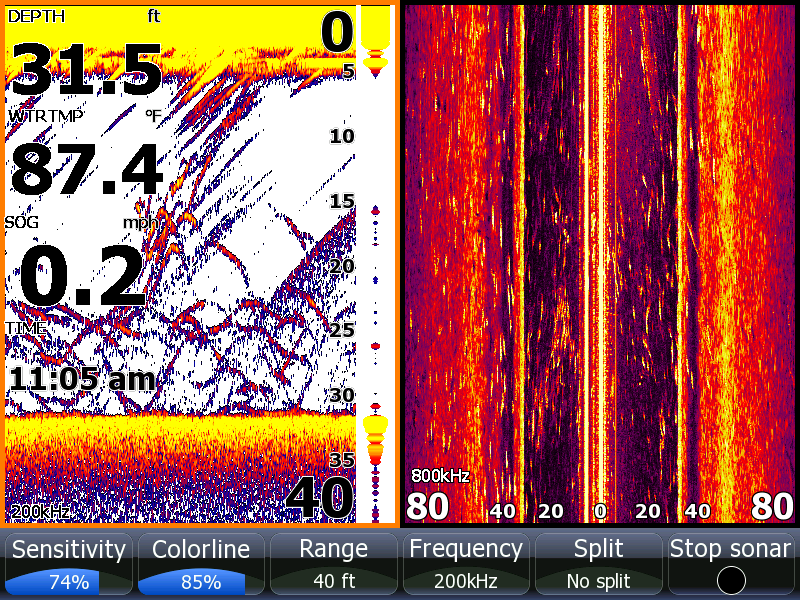 I found some fish in the mouth of a creek so we set up on them, caught a fish or two then got busted by another boater. He ran his motor over the fish and busted up the school so we left the area. I found a large school up against a channel bank so we worked it for awhile till it dispersed then we trolled through the area catching a fish here and there. I burnt $80 of fuel looking for fish today but never found any more schools. Ron is pictured holding up a nice Walleye that he caught today. Although fishing was slow today we all had a good time and were thankful the thunderstorms did not hit us today. 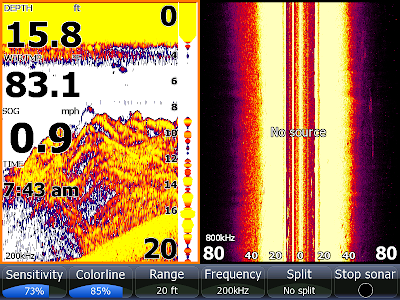 The 2 pics of my Lowrance show us over some schools we caught fish in today. Sunny and Hot, Water temperature 88* and Clear. DP wanted to take his children, niece and nephew fishing for a couple hours this morning so I woke Michael up early, caught bait and met the rest of the crew at daylight at High Point Marina. I put a Herring on a hook and let Taylor hold it in the water at the dock this morning while I was cleaning up the boat and she caught this nice Bass. We went out and found a couple schools before 8 this morning and the kids had a ball reeling in fish. We got off the water very early so the kids could rest up for Taylor's eleventh birthday party that they are having today at 1:30. Party at DP's today....everyone invited.....just bring present for Taylor. I picked the guys up at High Point this morning after catching 180 baits then went looking for Stripers. I saw a couple places where the fish were trying to school but will still a little too scattered to work so I continued to look till I found what I wanted to see. We had time to get all of our baits out before the first fish hit. Within 15 minutes we had put 7 keepers in the boat but I was starting to loose the school. I got on the big motor and located them a couple more times before leaving the school. We located and fished 6 or 8 different schools today. The full moon last night was pretty bright and I believe most fish were full this morning because when we were in the schools all of our lines did not go down, we just had steady action. Naturally we ran out of bait while we were working a school so I had to catch bait again in order to fish. 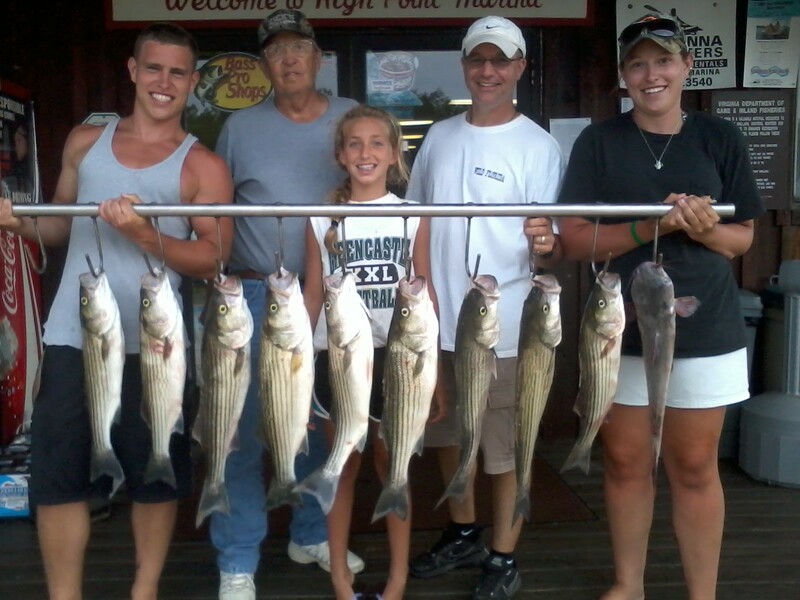 By now the boat traffic was up and we only caught about 6 more Stripers the rest of the day. It was a fun morning of fishing today.